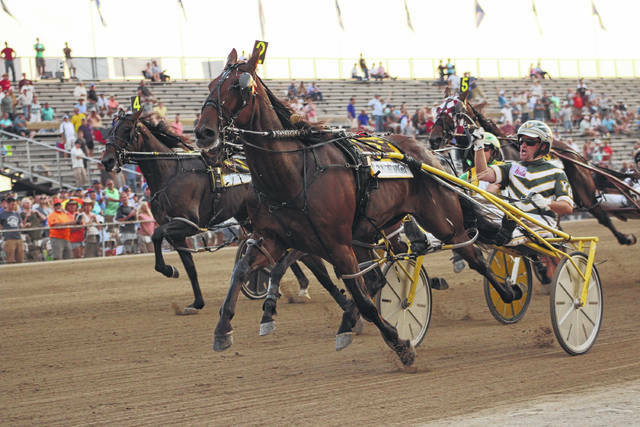 Filibuster Hanover used his front end speed to win the 72nd Little Brown Jug in 1 minute, 50 seconds at the Delaware County Fairgrounds on Thursday evening. When the gate’s wings opened for the $401,472 final heat, driver Yannick Gingras sent Filibuster Hanover out of post No. 2 and grabbed the early lead from a fast leaving Downbytheseaside (Brian Sears) from post No. 5. First heat winner Fear The Dragon (David Miller) was forced into fourth. Filibuster Hanover led the field of seven past the opening quarter in :26 4/5. Sears decided to send the pocket sitting Downbytheseaside to the front at the half in :54 3/5. Gingras and Filibuster Hanover refused to let Downbystheseaside by, forcing the latter to race on the outside. The eventual winner opened up some daylight at the ¾ pole in 1:21 3/5 as a tiring Downbytheseaside caused the chasers wide in the final turn. Filibuster Hanover won by a length over Funknwaffles (Corey Callahan), who rallied up the rail to finish second, and Miso Fast (Matt Kakaley) was third. The three-year-old gelded son of Somebeachsomewhere is trained by Ron Burke and owned by Burke Racing Stable, Joseph DiScala, Jr., J & T Silva Stables and Weaver Bruscemi. Gingras and Burke hoisted the Jug for the second time (2014, Limelight Beach). “This horse really has been good all year long, but has really improved recently and we always thought he could win this race,” added Gingras. The $188,928 first heat was a classic. Funknwaffles used the inside rail position and led the field of eight past the opening quarter in :27 1/5 and the half in :55 1/5. Fear The Dragon was the first to challenge, providing some needed cover for Miso Fast and Downbytheseaside. Funknwaffles remained a nose in front at the three-quarters in 1:22 4/5. As the field headed down the lane, six horses had a legitimate shot to win. Fear The Dragon received the last call and won by a neck over Filibuster Hanover in 1:50 3/5. Funknwaffles held on for third. Miso Fast was fourth and Downbytheseaside was fifth just ¾ of a length back of his stablemate. The official results of the first heat established the post positions for the second heat. With the winner’s share, Filibuster Hanover now sports $633,258 on his career earnings card. Yannick Gingras drives Filibuster Hanover (2) to a win in the 72nd Little Brown Jug Thursday evening at the Delaware County Fairgrounds.